The construction works at the initial Elisabeth Bridge of Budapest completed in 1903. However, the current Erzsebet Hid bears little resemblance with the former structure over the Danube, being the only bridge of Budapest which shares almost nothing in common with the original one. Indeed, given the serious damages suffered by the bridge during World War Two (it was virtually completely destroyed by the retreating German armies), the only parts preserved and comprised in the current structure refer to the foundations. They were kept not necessarily by reason of historical importance, but as a compromise, given the lack of funds that had to be invested in the construction of the new bridge. All in all, sources describe the former Elisabeth Bridge as one of the architectural engineering wonders of the world at the moment it was opened to public traffic, being the largest chain bridge lacking the support of riverbed pillars. It was dedicated to Queen Elisabeth, popularly referred to as Sissi, one of the most eccentric figures from the Habsburg dynasty. The present bridge bears the same name. 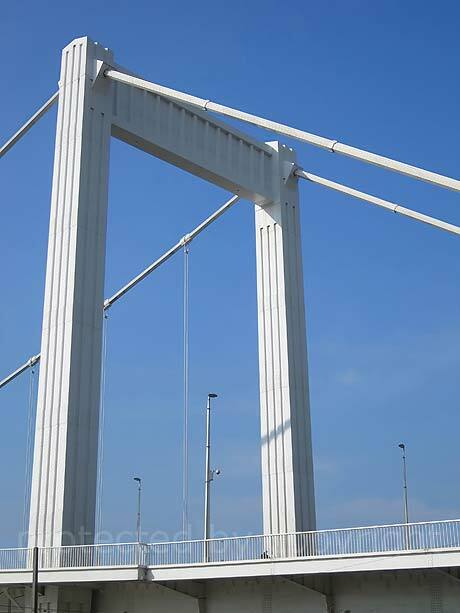 The new Elisabeth Bridge was completed in 1964, and it also used to feature a tram track, but only until 1973, when the authorities concluded the bearing capacity was exceeded by this type of infrastructure. It amounts to 378 meters in length and it features three traffic lanes and a pedestrian passageway. It is the result of the work of Pal Savoly, highly appreciated at the time for its innovative architectural qualities.